The view from the top of Mount Royal. A weekend away brings home new perspective. I sit in a little French bakery across the street from the AirBnb I rented for the long weekend. Sipping a cup of coffee and nibbling an almond croissant, I am finally able to reflect. Coming back to school has been hectic — faced with new professors to impress, finding time for recently-developed relationships and learning how to once again handle all of the work that piles up. The excitement of it all starts to unravel and the dead heat arrives. Where’s the motivation to move forward? With midterms nearing, feeling trapped on campus and homesick, I decide I should take a trip to clear my mind. I call up my brother and sister to see if they would like to join. “Let’s get out of the country!” my sister Nicki said over the phone. “Out of the country?” I asked. “Canada’s not too far,” said my brother Jordan in a matter-of-fact tone. Notre Dame Basilica in Old Montreal. The plan was in motion. A room was booked, arrangements made and a week later we would be driving up the coast to Montreal, a city none of us really knew much about. All I want to do is sit down in Café Myriade and drink coffee for the rest of my days while French-speaking people hurry to and fro around me. But I don’t. Instead, I take one last sip of comfort and get up to leave, ready to explore the populous, diverse and fascinating city that is Montreal. Montreal is the largest city in Canada’s Quebec province. Home of the 1976 Olympic Games, the region is known to be an important node in the global economic system. The city is centered around French customs, changing all of its signs from “Starbucks Coffee” to “Cafe Starbucks Coffee,” from miles to meters — and making most selections on a menu a guessing game. 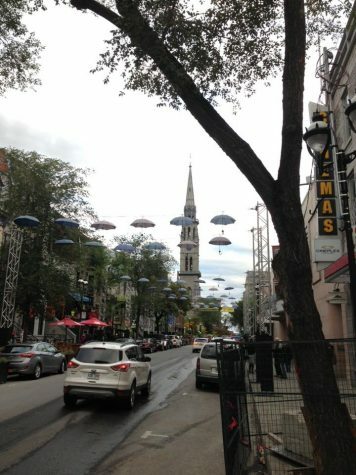 A display of hanging umbrellas in downtown Montreal. “Bonjour,” said a waitress at the entrance of Le Saint Bock, a noisy pub in downtown Montreal. I looked helplessly up at her, hoping she’d recognize my fear of speaking in French. I respond with a smile, secretly wishing I could speak the language so fundamental within the culture. In Montreal, I wanted to soak up as much information as possible. For a moment, I even wanted to learn French. Montreal is not only different in language, but in custom as well. The drinking age is 18 compared to 21 here in the United States. I walk into a bar called The Lab, hidden behind a door that looks like a wall. No one even asks for an ID. I nervously order a cocktail, one of the only drinks easy enough to say and the waiter smiles as if I made the right choice. I smile back. 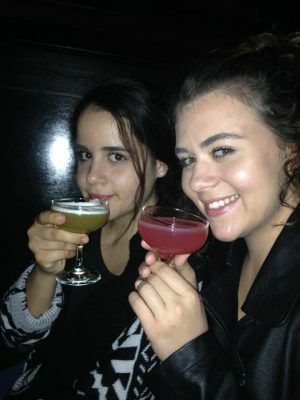 My sister Nicki and me drinking two different types of cocktails at The Lab in Montreal. 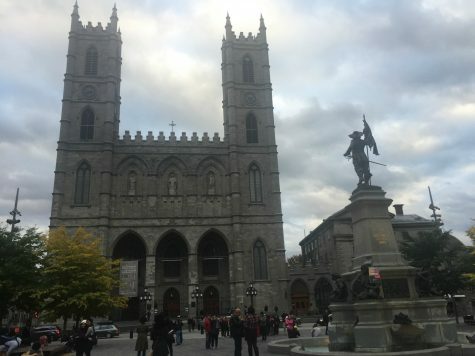 Most of the trip consisted of seeing beautiful sights including the Montreal Olympic stadium, the buildings of Old Montreal and various museums. 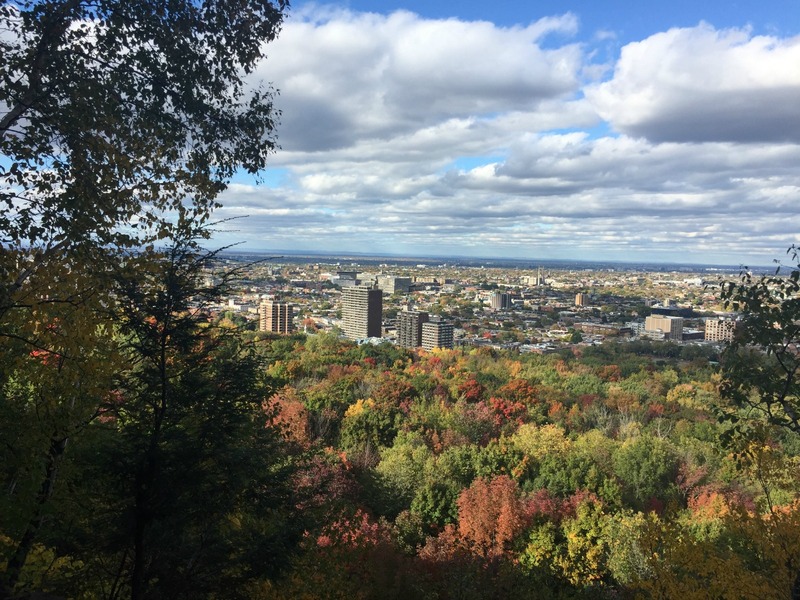 But no other place took me aback like Mount Royal, the mountain the city is named after. The mountain is surrounded by colorful leaves and provides visitors with a wide view of the city. It’s a beautiful site. Now, two weeks later, I sit in Hampshire Dining Commons looking out of the window as the brightly colored leaves fall from the trees. Sipping a cup of coffee and nibbling on a brownie, I hear the bustling of my peers to and fro. I feel refreshed. I am ready to face the challenges that may present themselves and am excited for new opportunities to come my way. I take one last sip of what was once a comforting cup of coffee and get up to leave. I am ready to explore the populous, diverse and fascinating city that is the UMass campus. Email Caeli at [email protected] or follow her on Twitter @caeli_chesin.